Onstage, the singing duo of Gabe and Mitzi Steiner captured America's heart for more than two decades. Offstage, their own hearts have throbbed as one for sixty years. Only now, Gabe has retreated into the tangles of Alzheimer's, leaving Mitzi to ponder her future alone. On the other side of Tulsa, everyone believes Brooke Woodson has found the perfect man—a handsome lawyer with sights on becoming Tulsa's next District Attorney. If only Brooke felt more sure. If only her fiancé could control his anger. If only love didn't come with so many scars. When an accident lands Brooke in the hospital where Mitzi volunteers, the two women quickly develop an unlikely friendship birthed by providence and bathed in grace. And with Mitzi's help, kindness, and insight, Brooke learns how to pick up the broken pieces of her life. Broken Wings was such a good book! The tenderness of the love story, Mitzi's faith, and Mitzi's devotion to Gabe really touched me. I finished the book feeling really happy that I read it. One of my favorite things is a first person narration, and when authors write in alternating points-of-view, both first-person narratives, that makes it even better. I felt like I really got to know both Mitzi and Brooke. Reading a first-person narrative really lets you in to a character's thoughts and makes the reading experience more powerful for me. There were two things that bothered me about Broken Wings. The first is that I wanted to yell at Brooke at times. It took her forever to see Lance for what he really was. I do think that Stewart did a good job at portraying an abusive relationship, but it is frustrating to read about a character whom you care about making poor choices over and over again. But, in the end, Brooke and her mother both had great character growth, which I loved. My second problem with Broken Wings was Mitzi and Hadley's relationship. Actually, the relationship wasn't the problem so much as the ending paragraphs. It felt to me like Stewart was ushering in Mitzi's next love before the first love exited stage left. I felt that was disrespectful to Gabe and out of character for Mitzi. Overall, I really enjoyed this book. Mitzi has the kind of quiet faith that I love to read about. I enjoyed the flashbacks the most, especially how she overcame her past. I would definitely read more from Carla Stewart in the future. 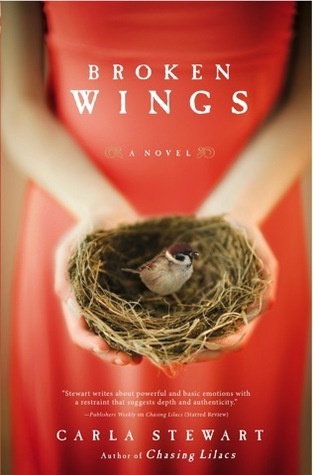 I would recommend Broken Wings to fans of contemporary fiction and Christian fiction.